A scanning electron microscope (SEM) is a type of electron microscope that produces images of a sample by scanning the surface with a focused beam of electrons. The electrons interact with atoms in the sample, producing various signals that contain information about the sample's surface topography and composition. The electron beam is scanned in a raster scan pattern, and the beam's position is combined with the detected signal to produce an image. 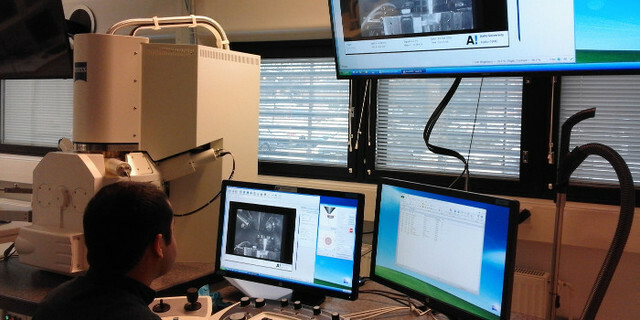 SEM can achieve resolution better than 1 nanometer. Contact administrator for pricing information. The EVO HD 15 has an enhanced LaB6 emitter, which provides a good resolution also at low kV. It has three operating modes: high vacuum (HV), variable pressure (VP), and enviromental mode (EP). Enviromental mode goes up to 2000 Pa for imaging also at humid atmosphere. The JIB-4700F features a hybrid conical objective lens, GENTLEBEAM™ (GB) mode and an in-lens detector system to deliver a guaranteed resolution of 1.6nm at a low accelerating voltage of 1 kV. Using an "in-lens Schottky-emission electron gun" that produces an electron beam with a maximum probe-current of 300nA, this newly-developed instrument allows for high-resolution observations and fast analyses. 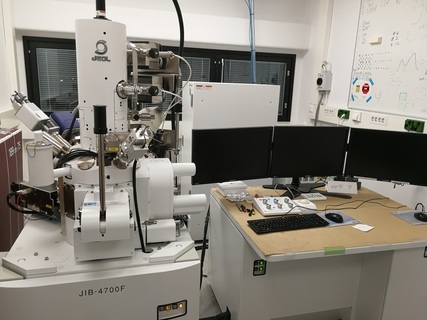 For the FIB column, a high-current density Ga ion beam of up to 90nA maximum probe-current is employed for fast ion milling and processing of specimens. Guaranteed resolution of 1.6 nm at a low accelerating voltage of 1 kV is delivered by a magnetic/electrostatic hybrid conical objective lens, GB mode and in-lens detector. Fast analysis is enabled because high resolution can be maintained in analyses under large probe-current by the combination with an in-lens Schottky-emission electron gun and aperture angle control lens. High-power Ga ion beam column enables rapid processing of specimens. Three-dimensional visualization of images and analysis data is possible with the combination with high-resolution SEM and appropriate optional analysis unit(s). 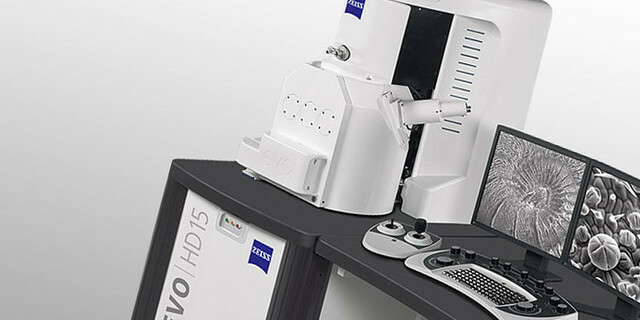 With the atmosphere pick-up system (optional) and stage linkage function, TEM (transmission electron microscope) specimens can be retracted with ease. Overlaying an optical microscope image from the atmosphere pick-up system on FIB images makes it easier to identify a FIB processing point. 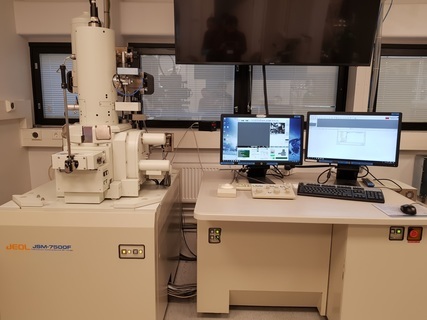 The JSM-7500FA is an analytical Field Emission (cold FEG) SEM featuring enhanced performance, ease of operation, and energy efficiency. It offers a high resolution also at low kV. It is also possible to buy imaging service. Contact Prof. Janne Ruokolainen for details. The Sigma has a Schottky FEG, which provides good resolution and the Gemini column offers ease of use. The Sigma VP has a variable pressure mode for poorly conductive samples. Contact nmc-training-sci@aalto.fi for device use training and Prof. Janne Ruokolainen for other details.